When you checked out Motorcycle.com today you probably noticed things don’t look like they used to. Don’t reboot you computer or visit your family doctor – it’s not you, it’s us. In the age of the Internet you can’t stay still for long, so we’ve redesigned Motorcycle.com. But this is more than a polish – we aim to make your experience a better one and we’ve made several changes to do just that. The biggest difference to you, the user, is one you’ve been asking for. You can now comment directly on our articles rather than logging in to the forum. So if you’ve got something to add to a review or just something you think is funny that relates to the article you’re reading, scroll to the bottom and let everybody hear about it. You can easily share your thoughts and opinions (and point out the occasional mistake) on anything and everything we publish from here on out. Just keep it clean. With this redesign, we are trying to make it easier for you to find anything and everything you’re looking for. That means the latest news is featured up front on the home page, along with all of our latest articles. It’s also easier than ever to find our Product reviews and How To articles, as well as search for new and used bikes in our classifieds. Visually, new articles will feature larger images and videos so you can see the latest bikes down to the smallest detail. 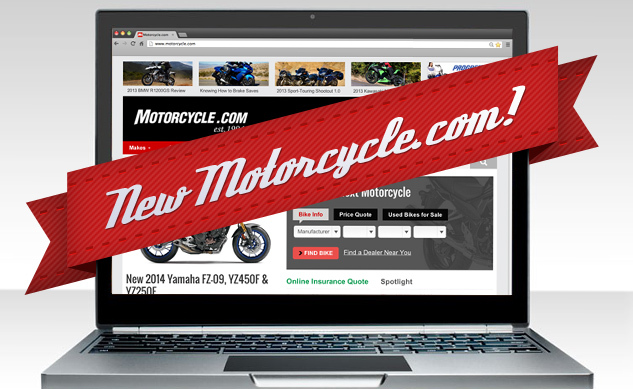 We hope you enjoy the new and improved Motorcycle.com. Let us know what you think in the comments below.